Interested in the Genetic Algorithm? Simulated Annealing? Ant Colony Optimization? This book covers these and other metaheuristics algorithms, and is intended for undergraduate students, programmers, and non-experts. It also covers a wide range of algorithms, representations, selection and modification operators, and related topics, and includes 71 figures and 135 algorithms great and small. Metaheuristics is a common but unfortunate name for any stochastic optimization algorithm intended to be the last resort before giving up and using random or brute-force search. Such algorithms are used for problems where you don't know how to find a good solution, but if shown a candidate solution, you can give it a grade. The algorithmic family includes genetic algorithms, hill-climbing, simulated annealing, ant colony optimization, particle swarm optimization, and so on. 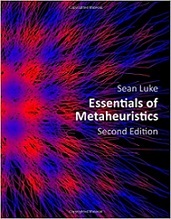 This book is an open set of lecture notes on metaheuristics algorithms, intended for undergraduate students, practitioners, programmers, and other non-experts. It was developed as a series of lecture notes for an undergraduate course I taught at GMU. The chapters are designed to be printable separately if necessary. As it's lecture notes, the topics are short and light on examples and theory. It's best when complementing other texts. With time, I might remedy this. Algorithms include: Gradient Ascent techniques, Hill-Climbing variants, Simulated Annealing, Tabu Search variants, Iterated Local Search, Evolution Strategies, the Genetic Algorithm, the Steady-State Genetic Algorithm, Differential Evolution, Particle Swarm Optimization, Genetic Programming variants, One- and Two-Population Competitive Coevolution, N-Population Cooperative Coevolution, Implicit Fitness Sharing, Deterministic Crowding, Nsga-Ii, Spea2, Grasp, Ant Colony Optimization variants, Guided Local Search, Lem, Pbil, Umda, cGa, Boa, Samuel, Zcs, Xcs, and Xcsf.